Living an organic, self-sustained lifestyle means respecting and utilizing the natural cycles already around us. Composting is a prime example as to how we can complete the natural cycle provide by farming or growing some of our food. Best of all, composting is a task easy enough for your kids! Composting is a simple process. You take the green and brown matter provided by your farm and kitchen. Over time, these materials break down, with the help of worms, into a nutrient-dense soil called compost. Compost is a key ingredient to building highly fertile, organic soil. You might be wondering what this natural cycle looks like as a practical application in your life. Whether you have a garden in place or not, you can start composting now. First, you need a bin or area to place the composted items. Ideally, it will have some cover to stop animals from crawling inside. Each day, you place your green or brown materials into the compost. I keep a bin on my countertop, so I only have to make one trip each evening outside to the bin. What are some materials you can include in your compost? The options feel endless! This list is far from exhaustive. There are hundreds of compostable items. However, there are some important things that you need to know not to put into your compost. You don’t want to put any meat products, such as fish, pork, chicken, or cooking fats like butter. Dairy products are also a no-no item. Anything treated with chemicals shouldn’t be added to your compost pile either. Once you have an area to put the compost, you are ready to get started. I typically add a bit of soil at the bottom, which makes it easier to mix. Each day, take the trip out to your compost and put the scraps from your day into the bin. It is a good idea to turn the pile with a shovel. Over time, your compost will fill up and turn into a nutrient-dense soil. As the next garden season approaches, you are going to use that soil to fill your garden beds. 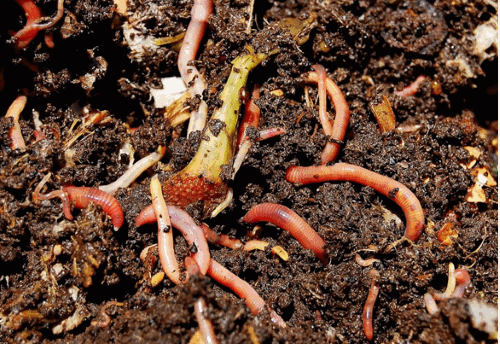 Why Should You Pick Vermicomposting? Vermicomposting is the technical term for composting with worms. Some people don’t use worms in their compost, except for the ones that naturally come in from the soil below. Starting off with vermicomposting has some extra benefits for your soil. Those little worms are food scrap eating machines, and they’ll chew through anything you put into the compost bin. At the same time, you’ll leave behind extra nutrients. The compost created from vermicomposting is even more nutritious than regular compost. The roots of your plants can absorb the nutrients left behind by the worms easily. It might sound strange, but worm poop is full of extra vitamins for your plants! Those extra vitamins give an additional boost to your plants as they grow. Another added benefit is that vermicompost is capable of holding more of its own water weight. If you live in an area that experiences droughts or dry spells often during summer, you might want to pick vermicomposting to provide your garden with water for longer. Vermicomposting is also ideal for those who live in smaller apartments or dwellings. There are a lot of urban homesteaders who use enclosed bins with ventilation right in their kitchen! If you do it properly, vermicomposting creates no strange smells. The worms aren’t likely to invade your kitchen or apartment unless you release them. It is a great way for urbanites to compost if they don’t have the outdoor space. A self-sufficient lifestyle requires us to consider each step in our lives, and how they connect in a fluid motion. The motion is like a circle, constantly bringing us back to one point, creating a cycle and rhythm. Composting is another step in that fluid motion that gives back what we need. Composting allows you to reduce your waste. Instead of tossing out all of those veggie scraps or newspaper clippings, you can add them to the compost. Your trash output will greatly decrease, which is one of the reasons that composting is great for the environment. Composting allows you to create a healthy, abundant garden. Using compost increases the nutrients and vitamins in your soil, along with beneficial microbes. Composts act as food for your soil and allow those nutrients to be slowly released to your crops over their growth span. It will improve your soil structure, increase moisture, and improve the workability of the soil. All of those things lend to one simple fact – your garden is going to flourish with the use of compost. That means you will be able to provide more food that year for your family. Your crops will explode, grow larger and have higher yields. You will be able to preserve more, sell more and feed your family easier. Then that amazing cycle starts again. You take all of those scraps of the garden throughout the year and add them to your compost bins. The worms get busy, eating the scraps and brown materials, leaving behind their excretions full of nutrients. Then, we add that soil to the following year’s garden. 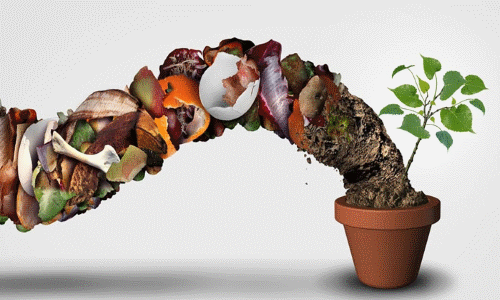 There aren’t too many examples that show us a very clear natural cycle such as composting. If you are looking for something to add to your self-sustained lifestyle, I highly recommend you ensure you have at least one working compost bin. Vermicomposting is possible everywhere, including for those who live in apartment dwellings! It is never too late to start composting. Her passion is gardening. Along with her husband and children, each year they grow a garden large enough to provide their family of five with over half of their needed produce. Besides vegetables and a small berry patch, she also focuses her attention on beautifying their home with strategically placed flowers, herbs, and flowering plants. Gardening is more than just a hobby; it is a way of life.